Declining unemployment claims and job openings near an all-time high point to an expanding labor market, not one that is losing momentum as suggested by weaker-than-anticipated job creation in May. The slight gain in payrolls, however, offers the Federal Reserve an opening to withhold a rate hike this month and delay action until it believes economic momentum supports a hike. The central bank will also have more time to digest the effects of a possible exit from the European Union by Britain, which will be determined by popular vote on June 23, due to the potential for volatility and uncertainty. 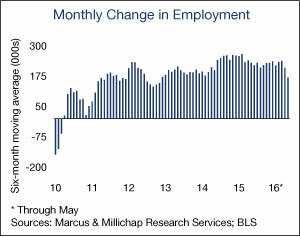 Employers added 38,000 jobs in May and downward revisions were made to the preceding two months. Goods-producing industries contracted during May, but sectors with strong ties to consumers bucked the broader trend of slower hiring. The healthcare sector continues to expand as more workers enroll in employer-sponsored plans and the population ages, supporting a gain of more than 55,000 healthcare positions last month. Bars and restaurants, meanwhile, accelerated hiring from 9,200 positions in April to more than 22,000 new jobs last month in response to growing consumer spending on services. Information employment, though, declined by 34,000 posts in May, primarily as a result of a strike by Verizon. Numerous measures of labor market slack remained tight last month. The underemployment rate was unchanged at 9.7 percent, marking the eighth consecutive month of a sub-10 percent reading. The rate peaked at 17.1 percent during the recession. Labor market stress also eased last month, with the number of long-term unemployed falling to the lowest level in eight years, a trend that will be considered in the Fed’s monetary policy deliberations. The willingness of consumers to spend on discretionary items, including dining and entertainment outside of the house and travel, is supporting the strong performance of service-oriented commercial properties. Bars and restaurants remain highly sought tenants in shopping centers for their ability to attract customers and helped to maintain the U.S. retail property vacancy rate near 6 percent in the first quarter. Low gas prices also provided a lift to spring travel, resulting in higher U.S. hotel occupancy in April. Through the first four months of this year, U.S. occupancy rose nominally to 62.5 percent and supported modest growth in key revenue measures. Payrolls in professional and technical services, a predominantly office-using employment sector, grew by nearly 26,000 workers in May, surpassing the total added in the preceding month. In addition, temporary staffing declined last month and has contracted year to date. Office employers’ willingness to commit to permanent workers will trigger a higher rate of tenant expansions in the coming months and contribute to net absorption of 86.5 million square feet in the U.S. office market this year. The increase in occupied space, combined with restrained construction, will reduce the nationwide office vacancy rate 30 basis points to 14.8 percent in 2016. This entry was written by marcusmillichap, posted on May 10, 2016 at 11:27 pm, filed under Uncategorized and tagged Commercial Real Estate, Commercial Real Estate Research, CRE, Economy, Employment. Bookmark the permalink. Follow any comments here with the RSS feed for this post. Post a comment or leave a trackback: Trackback URL.